For the first time in over a decade, we have some brand new Decoder & Substance material. Red rolls in with a stripped-back rough-edged drum loop straight from the old skool. In the upper registers, Susie Ledge’s sparkling vocals meld with silk-smooth strings to hold a perfect counterbalance. Then there’s a hint of danger as bass tones rear their head, and the one and only Jakes steps up to the mic to signal the launch of a full-scale junglist assault. And better watch out for that second drop that takes things to a whole new level of filth. Then Document One get their hands on the stems, and show how they do things. They open up with a pristine electro-tinged combination of percussive arpeggios and reprocessed snippets of Ms Ledge’s vocals to create a whole new vibe. The drop brings out a liquid side to the tune, adding the funk that Document One like to bring to the party. Tight drum programming, syncopated bass and builds reinforced with Jakes bars mean that this mix is aimed directly at the dancefloor. Finally, LA’s in the house as Kronology bring their style to bear on Red too. They’ve deconstructed the track and scientifically re-engineered it as a DJ weapon, bringing energy straight from the word go. Rolling drums support the vocals in the intro, before a mighty detuned bassline drops. And the track keeps building from there, as additional layers of percussion raise the temperature. Adding in the extra ingredient of Susie’s vocals and modulating pads give an extra twist of euphoria to proceedings. This is one to keep the rave moving. 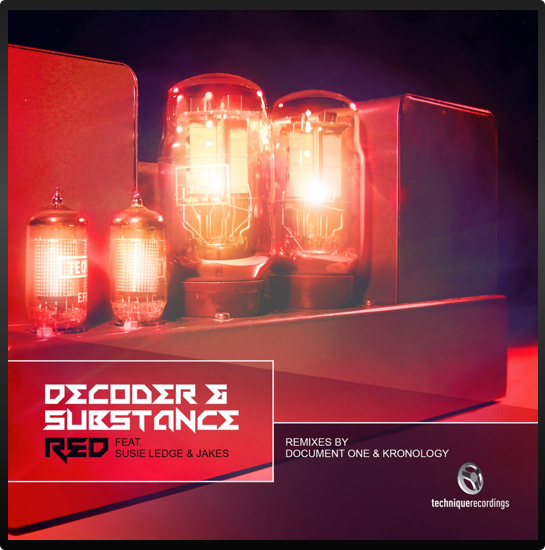 Red combines the dark rave elements of classic Decoder and Substance tunes with the sultry soul that made Kosheen a household name across the globe. Their road-hardened experience combined with two crews from the new generation on remix duties, means that this release is due for some serious rotation.